Join Doximity.com— the online physician-only network—today to have the opportunity to vote in U.S. News & World Report's "Best Hospitals" within your specialty. Board-certified specialists in one of U.S. News & World Report's surveyed specialties are invited to vote in this important hospital ranking. What's more, Doximity.com offers you a variety of tools and services, such as CME offerings and HIPAA-secure messaging. CLICK HERE to learn more. Erlanger’s EpicCare Link gives you a free, secure, web-based health record where you can access, monitor, and follow your patient’s care outside of your practice. What can I do with Erlanger’s EpicCare Link? 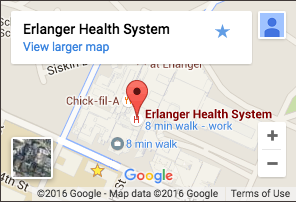 See your patient’s appointments at Erlanger. View tests results from Erlanger physicians. Review provider notes and visits that your patients have had at Erlanger. Conveniently communicate with Erlanger providers through built in messaging tool. Your practice can put in a request to gain access to EpicCare Link. Just click on the link and choose “Request New Account”. Access your hospital patient information (demographics/transcription/test results/documentation)via the secure VPN. Access the UTCOM Extranet, which provides remote rotation scheduling, remote learning, and remote evaluations. CLICK HERE to view current Physician Opportunities.